Just like us, our dogs can get cold in the winter and just like us, they can get sick! Fortunately, there are plenty of things you can do to help your dog maintain their body temperature during winter weather. With a little research, you can learn how to keep dogs warm in the winter and safe during cold weather. It’s easy to assume that because our dogs have “fur coats” that they are always well insulated against the cold. It’s important to realize, however, that there are many factors influencing how your dog experiences extreme weather. As your dog’s guardian, it’s important that you pay attention to his reaction to temperatures outdoors and provide supplementary heat when necessary. Some dogs, like puppies, seniors and very small breeds, get cold much faster than others. By observing your dog, you'll be able to tell how he deals with the cold winter weather. You'll quickly figure out what your pet's tolerance to the cold is, and you'll be able to figure out what you can do to better equip your pup to deal with the weather. The easiest way to know how to keep dogs warm in the winter is to learn when it’s too cold for dogs to go outside. This means knowing what the temperature outside is with the wind chill factor AND knowing whether other serious conditions are expected. When it’s 20˚ F outside, it’s too cold for any dog to be walking. Above 20˚ F it may still be too cold to walk if conditions are icy, very windy, or if your dog is very young, old, or has a compromised immune system. If it is safe to go out, make sure to keep walks short and keep your pup wrapped up warm with their feet protected. Not all dogs will benefit from a sweater or jacket, but many dogs can. Hairless breeds should always wear some type of winter dog clothing in cold climates. Short haired and small breeds should also always wear a sweater or jacket to help keep them insulated during winter. While this isn't really a tip about how to keep dogs warm in the winter, it is a tip on keeping them safe. When winter arrives it often means chemicals being spread on sidewalks to prevent icing. 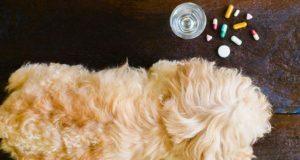 These chemicals can absorb into your dog’s paws and end up being ingested if your dog licks their paws when they get home. Even if chemicals aren’t spread to prevent icing, sharp ice pieces or objects hidden under snow can be dangerous to your dog’s paws. You can protect your dog’s feet by purchasing hard sole booties for walking or purchasing protective paw wax to protect against chemicals. If you rely on paw wax, it’s important to clean your dog’s paws when you get back home every time you go walking. A dog should never be made to sleep outdoors. As social animals, dogs want to be close to their family and the isolation of being an “outside dog” is torturous to them. It is particularly important to have dogs sleep indoors during winter months to keep them protected against the cold. Even with outdoor shelter and housing, it’s possible for dogs to succumb to the cold or become ill. The best way advice on how to keep dogs warm in the winter is to keep them out of the cold and weather as much as possible, meaning invite them inside. As an alternative, you can always provide your cold pet with a dog house with a heater. Some dogs just love to play in the snow, but you should monitor and limit outdoor playtime during the winter. Just like human children, dogs can get caught up in playing and forget to monitor their body temperature. It’s up to you to monitor your pup and make sure that they aren’t spending too much time out in the cold. Ideally, your dog should spend just 30 minutes or less playing outdoors at a time, according to veterinarians. Of course, if temperatures are dangerously low, they shouldn’t be outdoors at all! This is one of the most easily overlooked tips for how to keep dogs warm in the winter. You must make sure that your dog’s bed is kept away from drafty areas of the house. For example, keep their bed away from open chimney flues or doors with large gaps underneath them. Drafts can not only bring chills, but they can also give your pup a cold! If your dog is extra sensitive to the cold, even when staying inside, you can use a warming bed or pet heated pad designed to keep dogs warm in cold months. Some are only indoors, while others work both indoors and outdoors. Most heating mats create additional warmth for your dog without putting them at risk of electrocution as a regular heating pad might and are completely autonomous, meaning you do not need to monitor them all the time. The warmest times of the day are when the sun is up, so limit walking or playing outside to times when the sun is up and shining. Night time potty trips should be short and your dog should always wear a coat if their breed or health requires it. When learning how to keep dogs warm in the winter, this is the easiest tip on our list. If your dog shows signs of being cold or if you think they would like a little more comfort, offer them extra blankets. Contrary to popular belief, blankets for dogs can be extremely useful, especially during very cold winter months, and most dogs love them. This gives them the option of covering up or burrowing to keep warm if they want to. Ice and snow can get between paw pads and cause feet to get very cold! Shovel any snow or ice around your home in areas that your dog may walk. This will not only keep their feet from getting too cold, but it will also help you all to avoid accidents. Something that has been said over and over again, even if you’re just going to be in the store for five minutes and even if your dog is a husky with a big fluffy coat, NEVER leave your dog in your car alone. This goes for winter, summer, spring, and fall. Your dog will always be much more comfortable in the controlled temperature of your home where they have access to food, water, and comfortable furniture. Learning how to keep your dog warm in the winter, or during any other season of the year, includes keeping him dry. If you go out in the snow or ice with your dog, make sure that you have a doggy towel waiting to dry them off when you come back inside. The longer your dog’s coat stays wet, the higher the chance that they will catch a chill. Leaving your dog with a wet coat can also result in their skin drying out or becoming irritated if your dog rolled in any ice salt or de-icing chemicals. If you think that your dog has rolled in anything out in the snow, it’s best to rinse them off thoroughly in the shower and dry their coat afterward. Keep an eye on the affected area into the next day to ensure no damage has occurred to the skin. If you have a dog that requires regular grooming, keep winter weather in mind. That doesn’t mean that you can’t groom your pup in winter, but it does mean that you shouldn’t go for those close-clipped, nearly-naked cuts. 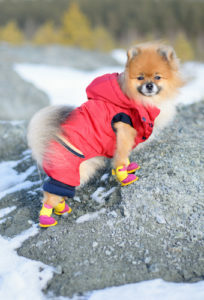 Your dog relies on their coat for insulation against the cold and when you remove a large portion of that coat, they are no longer able to keep themselves warm. It takes extra calories to learn how to keep dogs warm in the winter – not for you, but for your pet! If your dog spends time playing out in the snow or even if your home is chillier than usual, consider giving your dog a little extra food. The extra calories will fuel their internal thermostat and help them to stay warm. You can determine if your dog requires extra calories in winter by tracking their weight. If you notice that your dog begins to lose a pound or two, try adding a little more food to their diet to compensate for the cold weather. MORE: Why Do Dogs Sleep More In Winter Time? Not everyone likes to let their dog sleep on the bed with them, but if you do, there is no better time for snuggles than winter. One more body on the bed means extra body heat for all of you. Research has also shown that sleeping with your dog can help to reduce depression, improve overall feelings of well-being, reduce anxiety, reduce high blood pressure, increase the release of serotonin, and improve your health overall! Even if your dog is exceptionally well trained, never let them off-leash in the cold winter weather. Hidden traps and pitfalls can lie anywhere and result in your dog slipping, sliding, or getting lost and freezing to death. Keeping your dog on a leash means that you can control where they are at all times. If you do want to give your dog a little more freedom, invest in a long leash. You can find long leashes as long as 50 feet which will allow your dog freedom while also keeping you in control. We advise sticking with a 15 foot long lead in winter, however. Older dogs and dogs with joint concerns tend to have additional trouble in cold weather. Their joints lock up and they tend to have an ongoing chill. Try finding a local hydrotherapy facility for your dog to help them warm up and get some exercise without weight bearing. Hydrotherapy uses a treadmill underwater in a large tank. The water in the tank is very warm. This allows dogs to exercise with the buoyancy of the water while the warmth relaxes the muscles and joints making exercise pain free. If your dog tends to get cold easily, take their blankets and create a donut shape around them. This creates a ring that holds in warmth and helps your dog to maintain their body temperature while sleeping. You can create a donut ring of blankets by simply rolling them up and creating a large O shape around your dog with a few blankets. Just don’t make the circle too large or it won’t work as well for maintaining heat. This one may seem like a no-brainer when learning how to keep dogs warm in the winter, but bear with me. There is nothing worse for the body temperature than swimming on a cold day. Avoid lakes, oceans, streams, etc. and only let your dog play in water indoors. If they get wet outside, they will quickly catch a chill and their coat may even develop icicles. This isn’t to mention the dangers of partially icy lakes and ponds where your dog can fall through the ice! It’s easy to forget when you are walking that where you go, you must also walk back. This is particularly true in the winter. When you get to your destination, you may feel too chilled or too tired to walk home again. This is why you should always monitor your walk with dogs in winter to make sure that both you and your dog can get back home again. When learning how to keep dogs warm in the winter, it's important to be prepared. You should also always take a fully charged phone with you when you go walking in the winter. This makes sure that you can contact someone in case you do find yourself unable to get home or if you have an emergency. READ NEXT: Can Dogs Get Fleas In Winter?